Chinese automaker JAC Motors announced Friday it will invest 500 million dollars to build a factory in Brazil’s north-eastern Bahia state its first outside China. 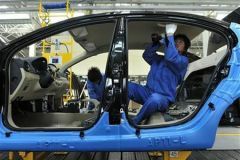 The factory, slated to open in 2014, will have the capacity to produce 100.000 units, Jianghuai Automobile Co. said in a statement. A total of 3.500 jobs are expected to be created. The investment will be made by the parent company in China together with the SHC Group, which represents its business interests in Brazil.